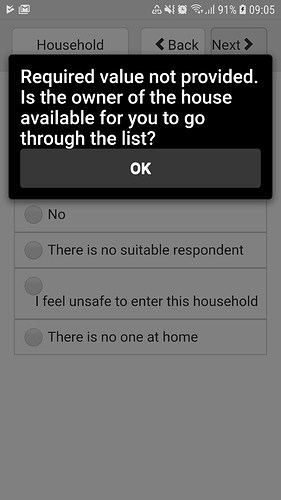 The screen provides the user with two options - either saving the form as "finalized" or saving the form as "incomplete". We would like to force the user to finalize their submission, i.e. we do not want them to have the option of saving their submission as 'incomplete'. How can we achieve that? We ran the simple "grunt" command again to push the changes to the device, but it seemed to have no effect - at the end of the questionnaire the "Incomplete" button was still there, next to the "Finalize" button. The screen looked exactly the same as before. It would be ideal if we could prevent the latter two cases as well, but it is not as important to us as preventing an incomplete submission via the "End" screen. 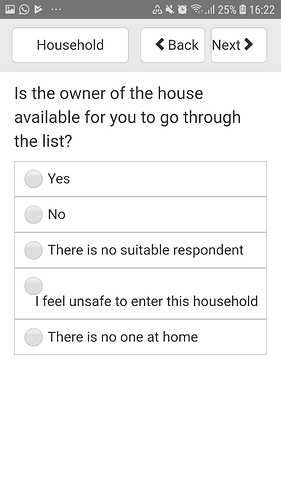 You could ad the following to the 'initial'-worksheet in your survey. I found this in one of the example forms and I'm using this method myself. It seems to work fine. I've tried that now, but it then gives me problems with required values. Please find a shortened copy of our XLSX form attached. 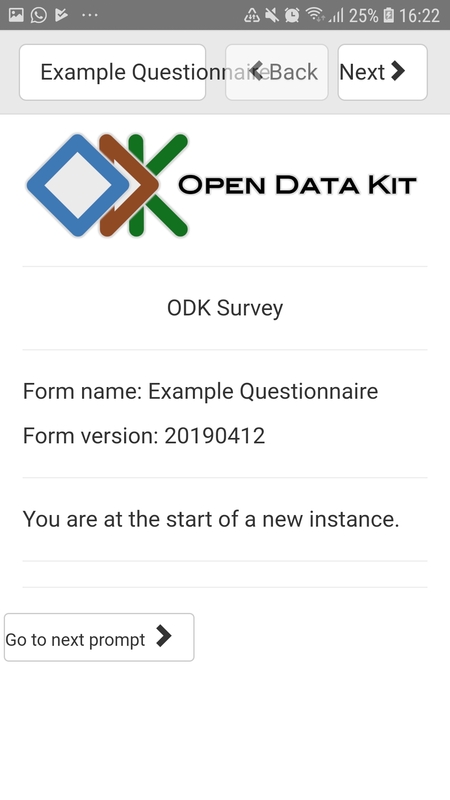 It now seems as if it is trying to finalize right at the very start of the questionnaire, without even storing the answer of the very first question. I'm in no way an expert and don't know why you get this problem. I haven't gotten this error in my forms, and I also make use of different required values. However I get the same error if I remove "goto _finalize" from the initial-sheet. Maybe your problem is elsewhere? Maybe @elmps2018 knows what could be wrong? So could you explain a bit more about the steps that caused the problem here? Is it that you just opened the first screen and got this error, or did you try to save as incomplete and have this problem? Thank you, @Andreas. I tested it now without the "goto _finalize" on the "initial sheet" and I see what you mean. It seems like it's the "do section survey" clause that is actually causing the problem... When I remove that too (i.e. having an empty "initial" sheet) the questionnaire works like it used to (still without the automatic finalization, though). Use the XLSX Converter that comes with the app-designer (ODK 2.1.0) to convert the example.xlsx spreadsheet to JSON and save it to file. 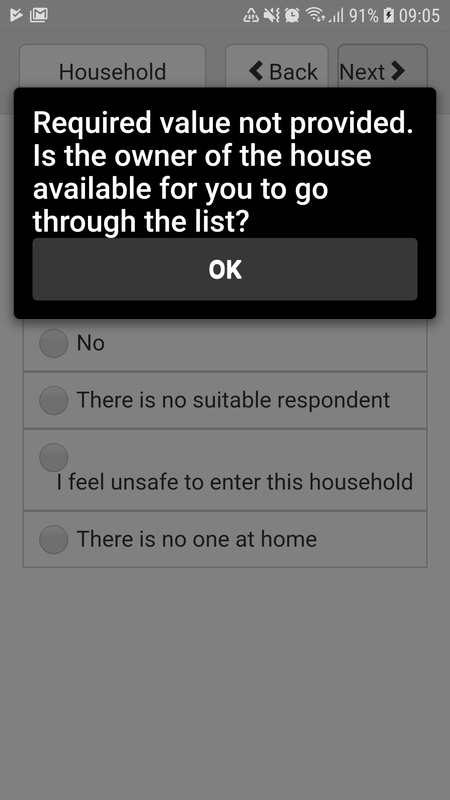 Run grunt adbpush-default-app to push the questionnaire to your mobile device. Open ODK Survey on your mobile device, go to "Sync" and click "Reset App Server". Once synced, click on the questionnaire to start a new submission. And at this point things become strange. Instead of showing me the usual screen (screen shot 1 attached) it jumps directly to the first question (screen shot 2 attached). Then, regardless of what option I choose as my answer at question 1, it presents me with the error (the screen shot that I attached to my first reply to @Andreas) when I try to continue to the next question - as if I didn't answer the question at all. And that leaves me stuck. Thanks for the additional detail especially in #4! I can at least tell you one thing that is going on. It seems like the goto _finalize also skips the add instance screen (see: https://github.com/AbalobiSA/Abalobi_docs/wiki/ODK2-Repeat-Groups) so that's why you are suddenly starting "in" the survey. One difference looking at your structure versus the examples I have is that you have additional sections beyond survey. I am wondering if that is causing some navigation confusion -- particularly since everything else in the form, it sounds like, worked fine before adding this. 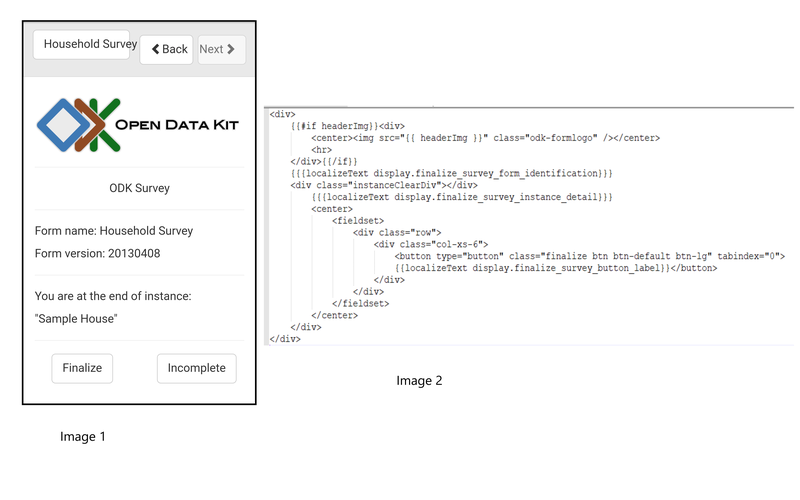 Have you tried experimenting with putting goto _finalize clause in a different spot within the survey to see if it helps address that, e.g. 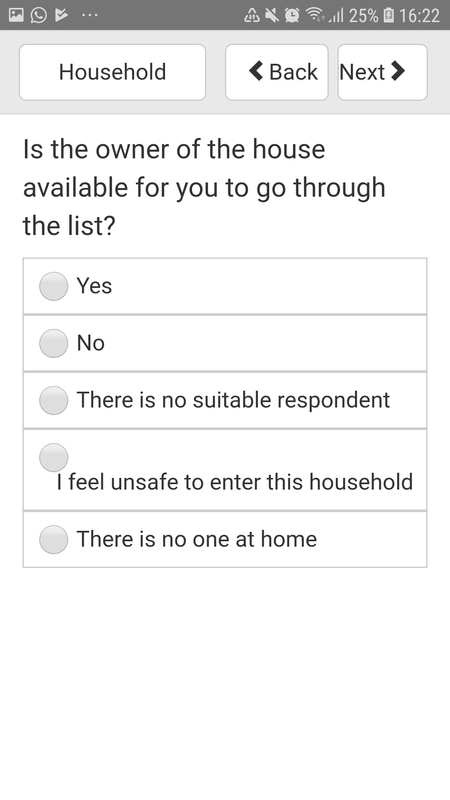 within the survey sheet? Experimenting with its location to see what behavior results is what I would try next. I did in fact try that, but then I get errors when trying to put the Excel workbook through the XLSX Converter. If I put the "goto _finalize" statement at the end of the "survey" sheet, I get the same error.